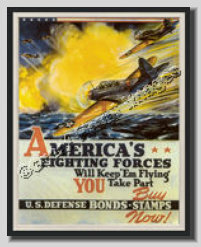 This reproduction depicts a great looking WWII vintage military poster for War Bonds. It States: "<?xml:namespace prefix = st1 ns = "urn:schemas-microsoft-com:office:smarttags" />America's Fighting Forces Will Keep Em Flying. You Take Part Buy U.S. Defense Bonds and Stamps NOW!" Helped promote PRIDE and HONOR in our military and country.